Sabang is the center of activity on the Weh Island, which is the largest among the small islands at the western tip of Sumatra Island. At that point, stands the Zero Kilometer monument as the marker of most western mainland of Indonesia. In astronomy, the point is located on an imaginary line 05º 54 ‘21.42 north latitude, with 95º 13’ 00:50 east longitude. ut’s located at 43.6 meters above sea level. The monument is situated in a forest in Ujong Ba’u Sabang, Sukakarya. Overall, the region has an area of 1300 hectares dominated by the fig tree (ficus sp). Declaration of zero kilometer Indonesia is based on observations with GPS (global positioning system) conducted by the Agency for the Assessment and Application of Technology (BPPT). 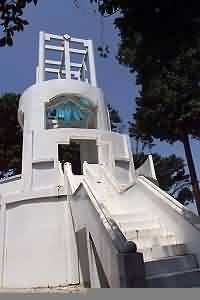 The monument was inaugurated on September 9, 1997 by Try Sutrisno, who was serving as the vice president of Indonesaa. However, the inscription that describes the astronomical position installed 15 days later and signed by Prof. Dr. Ing BJ Habibie, who was the state minister of research and technology / BPPT chairman. “Anda telah tiba di Km 0 Indonesia”(eng:”You Have Arrived at Km 0 Indonesia”). That words posted on brown board that greet every visitor. On the side of the monument, an Aceh traditional house is built for tourists who want to stay there. Zero Kilometer monument is basically a tube-shaped building with a height of 22.5 meters. The whole body is painted white and also the bars surrounding it. At the top end, the building is narrowed similar a form of drill. On top of that building, perched a Garuda statue holding zero number. Explanation of the astronomical position is shown on a black marble plaque located right in the middle of the building. There is also an authentic and legitimate evidence for visitors to prove that they have visited the zero Kilometer monument. A certificate from the City Government of Sabang. 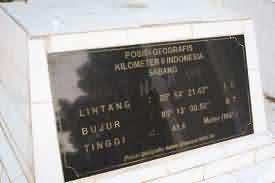 Each year, the local government provides tens of thousands of certificates validate that someone has visited Zero Kilometer monument in Sabang. Those certificates always run out before the end of the year. Therefore, if you hunt for a certificate, you should take a trip to visit the scene in the early years. But don’t worry. When about to leave the town of Sabang, visitors can order it and will be sent to their address when it’s available.